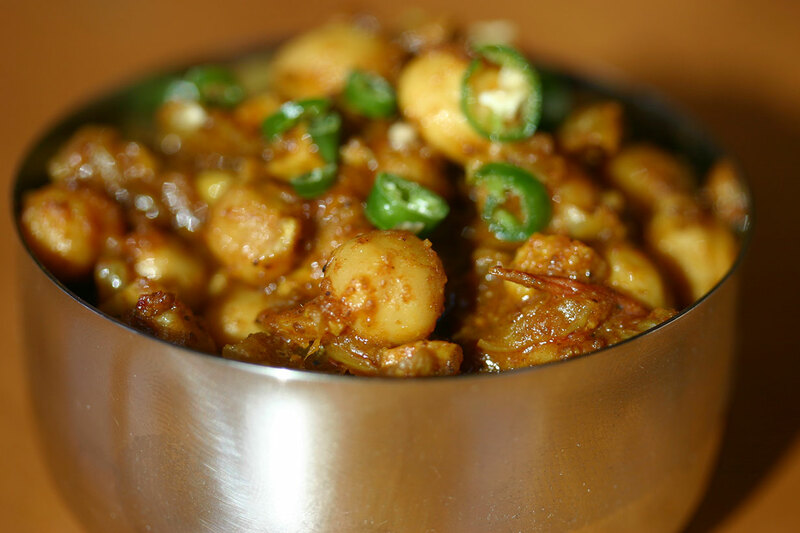 Very spicy delicious chickpeas is one of my favourite curries, and something I’ve been making forever. It seems like an excessive quantity of spices as you’re making it, but in time the sauce transforms into something thick, rich and delicious. This is yet another recipe from Madhur Jaffrey’s World-of-the-East Vegetarian Cooking, with minor modifications. A book I have owned so long the spine is held together with scotch tape, and love so much I actually went to the trouble of colouring in many of the line drawings. And this is my second copy – purchased in a second-hand bookstore in Tokyo for ¥800 when I was living there after finishing university. Heat the oil in a heavy saucepan over medium-low heat. Add the onions and garlic and sauté until golden. Add the coriander, ground cumin, chilli powder and turmeric, and stir through the onion-garlic mixture. Add the chopped tomatoes and cook for five minutes until the tomatoes are well amalgamated. Add the chickpeas and a cup of water and stir to combine. Stir in the ground roasted cumin, amchoor, paprika, garam masala and salt, cover and simmer for fifteen minutes. Stir in the lemon juice, green chilli and ginger and cook for a couple of minutes more. Serve with basmati rice or chapatis. Sounds like a must try. your enthusiasm and loyalty to the dish highly recommend it. It is a longtime favourite! Gorgeous! This recipe is the real deal! Can’t wait to try it. Thanks for posting! You are welcome — hope you enjoy it as much as we do! This brings back memories! When I moved to Japan for 2 years in the 90’s, the only cookbooks I brought with me were Joy of Cooking and World of the East Vegetarian Cooking! This is one of my favorite recipes. When I realized “saute until golden” meant “caramelize,” it brought the flavor over the top. I once ground all the spices from this recipe into a curry mix and gave it out as christmas gifts. I’m so pleased you shared that story. We were both cooking up our delicious chickpeas in Japan only a few years apart… I have made this recipe countless times, and never tire of it. Love your spice mix gift idea too.